We were tasked with a launch of a wonderful service locally. The business owner worked with us to develop a style that we transitioned into a successful site launch. We set up the hosting, installed a CMS to make the customer’s future growth scalable, and helped educate them on how to manage, update, and maintain their site (all without knowledge of code). This gave An Inspired Affair the ability to keep the site fresh while relying on Ikusa for technical improvements and search engine optimization. “Being a new business owner and not knowing much about web marketing or SEO, I contacted Sean Smith with Ikusa. I truly believe hiring Sean was one of the smartest decisions I made! Not only is he professional and knowledgeable but Sean goes above and beyond for his clients, taking the time to explain things in a way that someone without prior technical experience can understand. 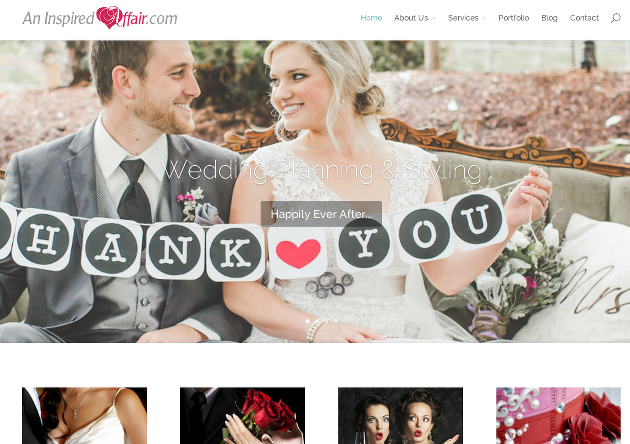 Ikusa has been a tremendous SEO and marketing asset for my company and I would recommend Sean and his company to any business looking to grow and strengthen their online presence!” – Heather Goodwin, Owner at An Inspired Affair.